Work Experience (Schooled in Magic IV)–Up Now! In the summer between Second and Third Year at Whitehall, Emily accompanies Lady Barb on her rounds of the Cairngorm Mountains, bringing magical help to the locals and searching for new magicians. For Emily, tired and broken after the events of Study In Slaughter, it should be a chance to relax as well as a visit to a new part of the Nameless World, to put her responsibilities aside and just be herself. mmunity to the brink of disaster … and that her oldest enemies are about to make a very unwelcome return. Download a free sample, then purchase it from the links on this page. And then read the annotations here! Had the NCT class today, so i wrote a snippet instead of Bookworm III. Although Commodore Biotin and Admiral Fredrik raise excellent points concerning the philosophical implications of other forms of intelligent life (aside from us and the Tadpoles), they are hardly the prime subject of interest to the readers of British Space Review. Not to put too fine a point on it, we are concerned with the outcome of the First Interstellar War and its implications for the future development of both the Royal Navy and the United Kingdom. Prior to the Battle of Vera Cruz, naval thinkers anticipated facing a human enemy, rather than an outside context villain. The Royal Navy was shaped in line with lessons learnt through studying American-Chinese skirmishes and war games conducted by the major spacefaring powers. However, when we actually were faced with a serious war, our doctrine proved to be largely insufficient. The disaster at New Russia, if nothing else, proved that our imagination when it came to alien threats was definitely inadequate. Indeed, were it not for the freak circumstances that kept Ark Royal in service, we would have lost the war. As it was, Ark Royal was able to buy us time to react to the new threat. However, the outcome of the war leaves us with a multitude of urgent questions, all concerning the government and defence of the human race. It is not my place to speculate on any of the proposals to turn the Earth Defence Organisation into a real government, but I must note that history suggests that any attempt to embrace a single government for much of the human race is doomed to failure. The Troubles – and the Age of Unrest – were largely caused by such attempts. Therefore, we must assume that the Royal Navy, while working closely with allies such as the Americans and French, will have to prepare for the future alone. This will not be an easy task. We started the First Interstellar War with fifteen fleet carriers, not including Ark Royal. Ten of those carriers, a significant proportion of our budget, were lost in the fighting, along with forty-seven smaller warships and an undiscovered number of support and replenishment vessels. The Royal Navy has refused to disclose the precise number of starfighters and their pilots lost in the war, but outside observers have concluded that eighty percent of the pre-war establishment died in the first year of the war. These loss figures, which are comparable with those suffered by the other major spacefaring powers, are truly horrific. This leaves us with a major problem. We must rebuild the fleet, at the same time as recovering from the damage inflicted on our country by the Battle of Earth and mustering as many freighters as possible to transfer settlers from Earth to Britannia. Failing to do so, despite the hideous costs involved, will merely render us weak and vulnerable, against both a recurrence of the war and conflict against our fellow humans. I hardly need remind the reader that many nations have suffered badly as a result of the war and some of them blame the whole conflict on us. Indeed, the troubles suffered by the Russians in regaining control of New Russia, following the Tadpole withdrawal from the system, suggest that a whole new series of inter-human conflicts may be about to begin. And there is a further threat. Prior to the Battle of Vera Cruz, we believed ourselves to be unique in the universe, the sole intelligent race. This belief has been resoundingly shattered by the war. We cannot afford to rule out the possibility that other races may be out there in the darkness – and that some of them will pose a threat. Or, for that matter, that we will be hemmed in by alien-occupied stars and find ourselves with no further space for expansion. Therefore, sirs, we must turn our attention to the task of rebuilding the Royal Navy, integrating Tadpole-derived technology and ensuring the security of the United Kingdom of Great Britain and Britannia. Seated at the opposite side of the compartment, Gillian McDougal sighed. Mary was five years younger than herself, a beautiful girl fresh out of university who had married her husband just days before he had departed on the Cromwell Mission. They’d thought – just as Gillian and her husband had thought – that they would be separated for less than a month before the secondary personnel were allowed to board ship for the distant colony world. But then the war had begun and a month-long separation had swelled into four years. Mary hadn’t wasted time finding a new lover to warm her bed. Not that I could really blame her, Gillian thought, as Higgins led the dark-haired girl out of the compartment. She barely knew her husband before she tied the knot. It had seemed an adventure, once upon a time. They would move from Earth to Cromwell; a whole new world, a human-compatible planet utterly untouched by any mortal hands. There, they would set up their own farms or businesses, which – because they would be in on the ground floor – would lead rapidly to wealth and power. Not a few new scions of the aristocracy had been created after the settlement of Britannia, Gillian’s husband had noted when they’d put their names down for the colony mission, and success on Cromwell would ensure that his children had a chance to truly make something of themselves. It was why he had insisted on leaving first, even if it meant leaving his wife and daughters behind for a month or two. He had been adamant it was the only way to ensure they staked a proper claim. She shook her head at the thought, then turned her attention to the datapad in front of her, barely reading the words. After so long, they were practically engraved in her mind; the complete records of the first survey party to visit Cromwell and certify the world safe for human habitation. Cromwell was everything Earth was not, even now; a safe environment, free of higher-order forms of life … and two-legged predators who would chase after her daughters, even before they entered their teens. It was a chance to build a new home, she knew, even though it would mean a great deal of hard work. But a doctor trained in emergency and colonial medicine could practically write her own ticket. Another quiver ran through the ship, followed by a bang that shook the bulkheads. Alarms started to sound moments later; Gillian had barely stood when the emergency airlocks slammed down, sealing the relaxation compartment off from the rest of the ship. It took her a long moment to realise that it was the hull breach alarm, warning that – somehow, somewhere – there was a gash in the hull. The ship’s atmosphere was pouring out into interstellar space. Gillian felt her mouth drop open. Boarded? Boarded by whom? Space pirates existed in dull entertainment programs, not real life. And which nation would risk war with the United Kingdom by attacking one of its colony ships? But they were so far from Earth, she realised dully, that it was quite likely that the ship’s ultimate fate would never be known. Gillian gritted her teeth. Mary looked at her, sharply. Mary looked disbelieving, but Gillian only nodded. They had no weapons, save for a handful of hunting rifles stowed in the hold. Even if the crew had been able to get them out in time before the pirates – or whoever they were – boarded the ship, they would not be able to offer any meaningful resistance. Vesper couldn’t hope to outrun or outfight even a small warship. Closing her eyes, she settled down to wait. Fair warning. This is a rant. What I would like to know, right here, right now, is why the person or persons who designed Windows 8 haven’t been fired. Ok, I’m used to working with Microsoft and I’m quite conservative, to the point I would prefer not to have to change. However, there have been so many problems during my shift from a Windows 7 machine to a Windows 8 machine that I am seriously considering just abandoning Microsoft Office and Windows altogether. The problems are starting to get on my nerves. One – you open Windows 8 and it demands your Microsoft account password. It sounds efficient and maybe it is, but it makes it impossible to sign on without an internet connection. Get a local account, you say? I keep getting error messages when I try. Two – the GUI is appallingly bad. I don’t want a dozen apps I will never use – I want my desktop, Microsoft Office, IE and not much else. Why do I keep getting an intro screen that makes me want to put a fist through the computer? Three – to add to this, it was difficult to work out how to shut open applications down. Anything that happened to be opened through the first screen lacked a ‘X’ button to shut them down. I ended up having to use task manager until I stumbled (literally) on the secret of closing them down. I’m sure it looks cool and flashy, but I want something simple! Four – I have a long list of spelling corrections from my old computer, which I wanted to transfer to the new machine. It should have been easy, as they were running the same version of MS Office. Need I say it wasn’t? It took hours of trying before I gave up and found an online macro that did the job for me. Five – I used to love the old Outlook Express from 2000, which is when I first opened a hotmail account. It was simple – simple is best – worked fine offline and did everything I wanted to do. The new Windows Live Mail, however, is ghastly. I don’t want my emails stacked up by subject, not least because it is grouping together messages from several different people who aren’t actually linked in my mind. In short, Microsoft, go back to Windows 98. It actually worked. Just (yet another) quick set of updates. First, Hard Lessons (A Learning Experience II) is now available. Download a Free Sample and then buy the complete version from Amazon here. 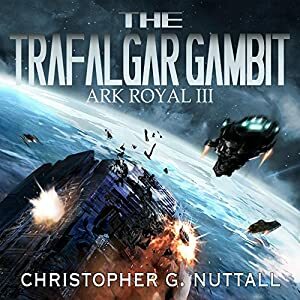 Second, The Trafalgar Gambit is now available in audio format. Download here! Third, I plan to start writing Bookworm III on Sunday, if everything goes according to plan. Fourth, I have completed the first set of edits for Work Experience, The Shadow of Cincinnatus and The Mind’s Eye. Publication dates will be announced ASAP. Fifth, I plan to be at NOVACON (14-16 November 2014) unless the baby gets in the way. I will, for the first time, have copies of both Schooled In Magic and First Strike to sell (as well as the Elsewhen books), probably for £10 each. If you are planning to attend and want a copy reserved for you, please let me know ASAP. I do have a small stockpile, but I can’t guarantee obtaining more before I head to Nottingham. The Trafalgar Gambit is now available on audio – download from the link below! New Book: A Learning Experience II–Hard Lessons! Good news first – we’ve found a place to live in Edinburgh. It’s maybe not in the best of locations, but it is somewhere decent and we have plenty of room for later expansion (it turns out that my collection of Baen paperbacks consumes around 30 shelves.) I’m not sure how long we’re going to be living there, but we will see. Bad news – I’ve been having bouts of depression. I don’t know why, which is bothering me. Send some prayers my way if you can. My current plan is to write Bookworm III next, then go on to Warspite. After that, I need some input. I can write the next Schooled In Magic book, the final Democracy book or Their Darkest Hour II. Which one would you like? I’ve also been messing around with plots for Book IV of The Royal Sorceress. How does this sound? There are several other issues worth mentioning. I’ve had a number of requests for EPUB versions of my books. As The Empire’s Corps is not exclusive to Amazon (because of the Stars and Empire box set) I’ve put the books online here, for download as EPUBs. If you liked the series, please feel free to leave reviews there <grin>. Work Experience (SIM IV) has had its first full edit. I’m hoping to see it online within a month or two, but we don’t have dates yet. The cover design is currently being finalised. As always, reviews and comments are welcome.